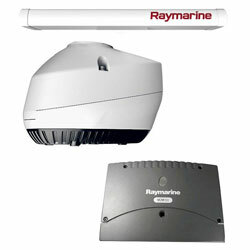 Raymarine Magnum 12kW Pedestal is compatible with either a four-foot or six-foot antenna array option. It offers a maximum range up to 96nm, ideal for blue water vessels. The perfect companion to Raymarine's award-winning Axiom® and Axiom Pro multifunction navigation displays (MFD) running LightHouse 3. Magnum is also backward compatible with legacy models including: LightHouse 2-based a, c, e, eS and gS-Series MFDs, C-Series Widescreen and E-Series Widescreen MFDs, E-Series Classic, and G-Series Multifunction Displays. Note: Not all Magnum features are available on all legacy MFDs*. Superior Bird Mode: Building upon their already exceptional bird identification technology, Raymarine has further advanced Magnum's Bird Mode feature to target birds with greater clarity up to 10 nm. Locating flocks of birds with Magnum helps anglers find schooling baitfish faster and with less fuel consumption. Enhanced Radar Imaging: Magnum radar also features Raymarine beam sharpening technology, delivering better than 1-degree bearing resolution for more detailed target separation, map-like coastal detail, and superior long-range performance. Best-in-Class Target Tracking: Magnum delivers better situational awareness with fully automatic MARPA target acquisition and tracking. Magnum also makes use of Raymarine's Evolution 9-axis heading sensor technology to deliver real-time, accurate target plots. True Trails: This feature allows you to see a historical "wake" behind every moving contact. This additional information makes it even easier to interpret the movement of other vessels and make smart maneuvering decisions to pass safely. Real Time Heading Updates: Connect Magnum with Axiom and LightHouse 3 and experience uninterrupted radar target imagery when making course changes. This feature allows the radar position display to rotate freely as-needed, without the need to refresh the entire display. * VCM100 with Emergency Stop Connection - The VCM's emergency stop feature is designed such that when the connected switch forms a closed circuit, the VCM's 48 VDC power supply will switch OFF (effectively shutting down the open array pedestal). In contrast, the switch located on the back side of the pedestal is simply intended to enable/disable rotation of and transmission via the open array. It is generally recommended that a breaker or switch be installed and dedicated to supplying power to the VCM and that it be switched OFF (after placing in standby and turning OFF) when not needed for extended periods. Most carriers impose an extra handling fee that will be added to your shipping charges if it applies.